Martin Luther is famous for his 95 theses against Indulgences, which he nailed to the door in Wittenberg on the 31st of October 1517. His less well-known 97 Theses were posted a few weeks earlier. 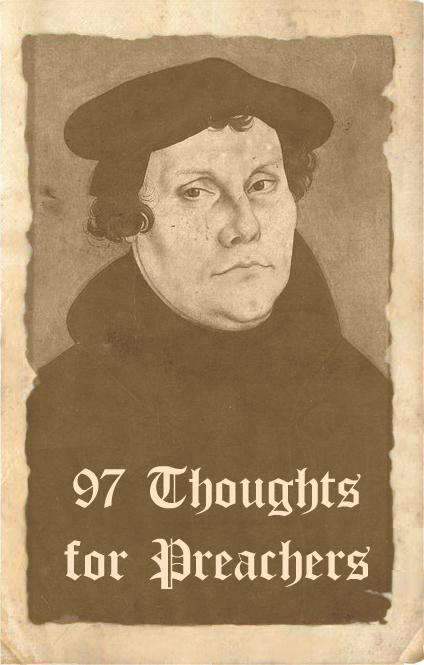 Later, when the eyes of the church world were on him, he looked back beyond the 95 Theses and went back to the issues raised in the 97 Theses to make his defense. Every time I look at the 97, I am struck by how on target Luther was about some very foundational issues. So I have pondered blogging through them for the sake of preachers today. I won’t go at a rate of one per post, but rather will summarise where the content feels too distant and requires too much explanation (you can see the full list here), then state specific theses and converse with them from the perspective of preaching today. The 97 Theses Against Scholastic Theology. Luther pulls no punches in his critique of the prevailing theological training of his day. Get foundational theological questions wrong and everything else will follow. As a preacher I am struck by that reality today. Good Bible interpretation, explanation and application built on flawed assumptions will make for potentially unhelpful or even harmful preaching. Theses 1-3 – Luther launches by affirming the widely respected Augustine as over against Pelagius, the heretic, who denied the full impact of original sin and asserted that humans have the ability to be righteous by the exercise of their free will. How humans operate is a critical issue for preachers and one we must ponder deeply. As preachers we have to grasp the depth of the human sin problem before we can hope to offer any sort of solution. Do we really get how pervasive sin is and how fruitless the human life is “by nature?” I tend to think of the story of the Lost Sons to illustrate this . . . both sons were lost, but their sin manifested with different fruit. One bore the red apple of riotous living. The other bore the green apple of self-righteous living. Both were 100% wrong in their response to a loving Father. Too often we see sin on the standard sliding scales and therefore evaluate who is more of a sinner versus who is less of a sinner. But if we preach only a shallow view of sin, we will be affirming a lot of “older brothers” who need to see the bad news of their situation too.